The Aegean Islands of Greece stretch almost the entire length of the Aegean Sea and are surrounded by Mainland Greece to the North and West, Turkey to the East and Crete to the South. Winemaking has been commonplace amongst these islands for thousands of years, and traditional winemaking and viticultural techniques continue to be practised in many communities, with much of the industry focused on growing ancient, native grape varieties, seldom found elsewhere. The ancient Greek name for the surrounding sea was 'Archipelagos' which gave us the modern name used for any significant grouping of islands. Some of these locations have also developed into tourist hot spots, often favoured for their white beaches, blue waters and dry,hot weather. These islands also feature many ancient ruins, which give us a window into the storied past of the Aegean Islands, as well as clues to the viticultural history here, which is often ranked amongst the oldest in Europe. A majority of the islands do have some wine production present, however for the sake of focus, just the five major wine-growing islands are listed here, especially due to the presence of PDO (Protected Designation of Origin) appellations at these locations. Starting below with Santorini, the tourist haven that is also home to one of the most significant wine communities in the entire Aegean. The idyllic, volcanic island of Santorini, is the jewel of the Aegean, and for most people, when they think of Greece, the image in their heads is one of white buildings, blue roofs and endless blue sky, an image that is likely almost entirely drawn from photos of friends and family visiting Santorini, which is now easily the most visited island in the Aegean Sea. With over 2 million tourists visiting Santorini and it's capital Fira, each year, the island is one of the most popular tourist destinations in all of Greece, and hosts a wine culture that dates back almost 5000 years, to the ancient Minoan civilisation originating in Crete, located 113km(70mi) to the South. The island is almost half-moon in shape, and is one the remnants of a series of volcanic eruptions that date back tens of thousands of years, though it was the latest major eruption that really changed the human face of the island, taking place in the 2nd Millennium BCE (between 1642-1540 BCE). Known as the Minoan (or Thera) Eruption, this volcanic explosion, is thought to be one of the largest ever experienced by mankind, with only 3 other eruptions rivalling the sheer amount of material ejected by the Santorini volcano. Each time the volcano erupted, the remains would collapse in a depression, which would then fill with seawater (currently the floor of the caldera of Santorini is around 400m/1312ft deep, while walls of rock tower over 300m/984ft above the water) creating the vast lagoon that is so famous today. The material ejected covered the island in 60m/197ft deep volcanic tephra, with this soil primarily being used today to yield small quantities of often high acid, high quality white wines, made from native grapes Assyrtiko, Athiri and Aidani. Assyrtiko is by far the dominant grape at nearly 3/4 of the 1,200ha/2965acres of vineyards planted on the island. Climate plays a huge part in creating wines on Santorini, as it is ostensibly a desert island, with only around 380mm/15in of annual rainfall, and little to no rainfall during the growing season. The island is also at the mercy of high winds, which blow across the Aegean and necessitates a unique style of viticulture where the vines are trained low along the ground, into the shape of a basket or bird's nest (called Koulara), which protects the vines from being damaged, as well as sheltering the ripening grapes from the harsh Mediterranean heat. Soils here are so extreme, that it renders the vines completely resistant to the grapevine pest Phylloxera, a 1mm(0.039in) long insect accidentally introduced to Europe in the 19th Century that soon wiped out a majority of vineyards across the continent. This means that most individual vines on Santorini are significantly older than elsewhere in Europe, with many well over 100 years of age. Though these ancient vines produce consistently high quality grapes, they may still be removed if the yield of the vine becomes too low. In this case, new vine material is often grafted directly onto the healthy roots of it's predecessor, and as such, root networks on the island can be centuries old and stretch many metres beneath the surface. Aside from high acid white wines, several other styles of wine are produced on Santorini, with about 20% of the island's wine produced being made from red grape varieties. Of these Mandilaria would be the most planted, though wines made from Mavrotragano grapes tend to command more attention due to their over-ripe characters that, when combined with deep red colour and soft tannins, have often been compared to a lighter-version of the Amorone style of wine from Northern Italy. Another important style made from over-ripe grapes (white in this case) is called 'Nykteri' , which is named for the local term for "working all night", as these grapes were usually harvested during the dead of night to avoid the effects of the daytime heat, and help retain natural acidity in the grapes (still held in significant amounts, considering how ripe the grapes are). These wines are dry, aged on skins during the first stage of fermentation, then are barrel matured for anywhere between 3 and 10 months, which can often produce richer, fuller bodied styles, with floral aromas and at times a hit of oxidation and bitter, phenolic characters extracted from the grape skins. By appellation rules these wines must be 13.5% alc of higher. Finally, a mention must also go to Vinsanto, a style of dessert wine on the island that results in a decadent product, that combines elevated sugar levels, achieved by a late harvest of white grapes (must be at least 51% Assyrtiko), followed by drying said grapes in the sun for 12-14 days to allow them to shrivel and concentrate the eventual grape must. After being crushed and fermented, the wine is the aged in oak for a minimum of 24 months. As such, with no additions of sugar or acid, the final result is a sweet wine, balanced by natural high acids, with a minimum of 9%alc and flavours of dried apricot, sweet spice, raisins and a distinct gold to dark amber hue. Vinsanto is often confused for the Italian Vin Santo (Holy Wine), which is understandable, particularly as the island was under the rule of an Italian city state, Venice (as well as it's allies) from 1207 to 1579. During this time, the island served as both an important trading port, as well as a source of wine which was sent throughout the Republic. In 2002 the EU ruled that the name Vinsanto [Wine (of) Santo(rini)], did originate on the island and as such is legally protected there, though the Italian style could still label as Vin Santo. Appellations: Santorini is home to just one appellation, helpfully named PDO Santorini (est.1971) which protects many of the aforementioned styles, stipulating that dry wines must be at least 75% Assyrtiko, and may only include Aidani & Athiri for the rest. Those labelled as "Nykteri" must additionally be no less than 13.5%alc and spend at the very least 3 months maturing in oak casks. As mentioned above, those wines labelled "Vinsanto" must be a minimum of 51% Assyrtiko with the remainder either Aidani or small amounts of other native white varieties. These grapes must be left in the sun to desiccate, raising the concentration of sugars to a minimum of 370g/l. The wine must then be aged for 24 months or longer, and must not have any additional sugar added at any point. Vinsanto may also be harvest-specific and as such multiple vintages may be blended together as long as the most recent vintage is indicated. Paros is in a prime location within both the Aegean Sea, and the Cyclades island group, as it is found almost equidistant between the tourist meccas of Mykanos, to the North, and Santorini, to the South. 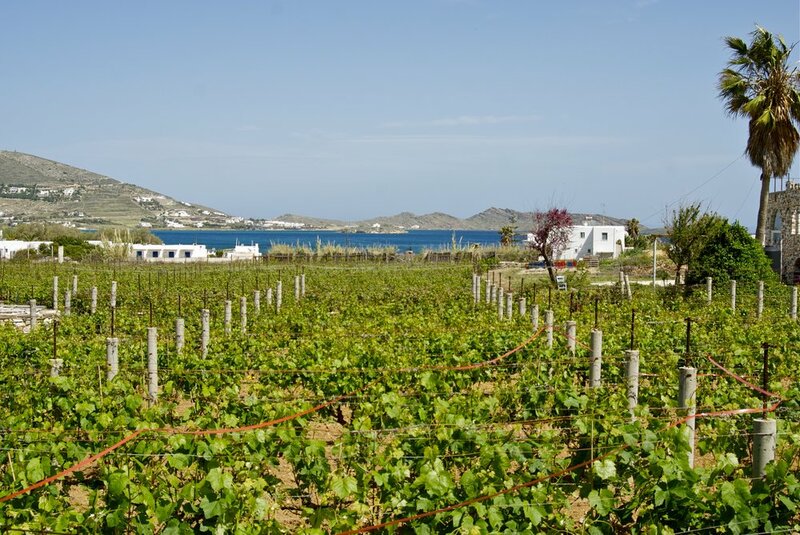 Like the rest of the Cyclades island chain, Paros experiences a dry growing season, with high winds that help keep the vines cool in the hot Mediterranean environment. Despite a number of appearances, the grapevine pest Phylloxera, has never managed to spread on Paros, meaning most vines are on their original roots and of considerable age. Two major grape varieties are grown on Paros, with the red grape Mandilaria grown on the lower slopes of the island's central mountain, Profitis Elias (726m/2380ft) and along the coastal plains, while the white grape Monemvasia (Favoured grape of the Venetians during their rule of Greece, also known as Malvasia in many other Mediterranean regions) is best grown on the higher slopes, thanks to their cooler night time temperatures, which allow for natural acids to be retained in the grape. Current vineyard plantings on Paros amount to around 485ha(1200acres) on calcareous and sandy-clay soils, resulting from erosion of the central mountain. PDO Paros (est.1981), allows for both red and wine wines to be produced under it's appellation, with white wines needing to be 100% Monemvasia and the reds needing to contain both Mandilaria (1/3) & Monemvasia (2/3), in order to be accepted, with the white grape helping to calm the harsh tannin and astringent characters that Mandilaria can exhibit. The wines must be aged for a mandatory period of 24 months in oak casks. You'll find the island of Rhodes located in the far South-East of the Aegean Sea and it serves as a portion of the border between the Aegean and the rest of the Mediterranean. The largest of the Dodecanese island chain which lies between the Cyclades group and the country of Turkey (just 18km/11miles away), Rhodes is also one of the largest islands in all of Greece by land area (approx 1,400sqkm/540sqm). Famously Rhodes was once home to the Colossus of Rhodes, a statue built in 280BC that is considered one of the wonders of the ancient world as it stood at nearly the same height as the modern Statue of Liberty (feet to crown). The island recently celebrated 2400 years of winemaking industry, with this history corroborated by a number of ancient amphorae bearing the seal of Rhodes, featuring either the Sun god Helios or a Rose (Rodo in Greek) having been discovered in several locations across the entire Mediterranean. One could say that this form of labelling was a precursor to the appellation system used worldwide today, guaranteeing that the valuable product genuinely came from Rhodes. On Rhodes the Aegean white grape, Athiri makes up a majority of production, and is especially favoured in the higher altitude vineyards found across the slopes of Mount Attavyros (1215m/3985ft) which features the ruins of a temple to Zeus at it's summit. Intense winds on the exposed slopes of the mountain mean that many Athiri vines are trained into low goblet formations to protect the ripening grapes. Lower foothills of the mountains feature granitic soil that is warm and well-draining, which suits the red variety Amorgiano (Mandilaria) and allows for low yielding vines that produce highly concentrated wines. Much like many other Aegean islands, the grapevine pest Phylloxera, could never establish itself on the island, so many vines are grown as tradition dictates and are often long-lived. For many years Rhodes has also been recognised as a home for being a leader of sparkling wine production with many excellent bottle-fermented styles being produced alongside several tank-fermented labels as well. Appellations: Rhodes is home to two specific appellations the major one being PDO Rhodes, for which white wines must at least 70% Athiri, with Assyrtiko & Malagousa recently permitted. Reds must at least 70% Amorgiano (Mandilaria) with Mavrothiriko recently allowed as a blending partner. The other PDO is a unique sweet wine appellation named PDO Muscat of Rhodes(est.1971) created specifically for the grape varieties of Muscat Blanc & Muscat di Trani, two different clones of the Muscat family of grapes. Samos is another major island in the Aegean that has a significant history when it comes to wine, with texts dating back to the 5th century BC extolling the virtues of the sweet Muscat wines of Samos. These sweet wines became favoured across Europe once again during the 19th century, when the grapevine pest Phylloxera had all but wiped out the vineyards of France & Italy. During this time Samos was even given the privileged honour of producing holy communion wine, which was certified by the Catholic Church, a practice that continues to this day. It is interesting to note that Samos was the birthplace of many individuals whose deeds have remained famous throughout the ages, including the mathematician Pythagoras, the astronomer Aristarchus of Samos (first known individual to suggest the Earth revolves around the Sun), as well as the philosopher Epicurus. Samos is located just 1.6km(1mi) from Anatolia (Turkey), separated only by the Mycale Strait, giving rise to the name 'Samos' which according to ancient Greek geographer Strabo, means 'rises by the shore' in the Phoenician language. This highly mountainous island today remains covered in vineyards that stretch from the lowest coastal plains, right up to heights of around 800-900m/2625ft-2950ft, where the cold nights found at these elevations, slow down ripening and allow the grapes to retain acidity, useful for crafting a complex final wine. A majority of the nearly 1780 hectares(4400acres) of vineyards on Samos are found upon the Northern slopes of Mount Ampelos (1095m/3595ft) whose very name translates to 'Vine'. Here the vineyards are grown upon mountainside terraces locally called pezoules. These tiered plantings allow for access to the neutral, low yielding, and free-draining granitic soil found upon these eroded mountain slopes. Over 95% of the grapes grown on Samos are of the Muscat Blanc variety, something that speaks to the dedication of the island's own particular wine management, with the 'United Winemaking Agricultural Cooperative of Samos' (est.1934) being the sole major wine producer on Samos, with over 2,200 individual growers and winemakers included within the cooperative. Appellations: The solitary appellation of the island is called PDO Samos and is limited to 100% Muscat Blanc and is produced as a world-class sweet wine, favoured in many markets around the world. Located in the North Aegean Sea, Lemnos is one of the largest Greek Islands, located almost equidistant between Mount Athos on the Halkidiki Peninsulas, and The Dardanelles, in modern day Turkey. As with other Aegean islands has a storied history of wine production, stretching back to the time of Homer, with many famous writers and philosophers throughout classical history paying homage to the wines here; most notably Aristotle who often mentions the native grape variety Limnio, and Athenaeus who claims ..“there is no better wine to drink than a sweet wine of Limnos”. The island is also regarded as sacred to the followers of Hephaestus, the ancient Greek god of metallurgy and the forge, and in Homer's famous work "The Iliad", the god himself claims to have fallen upon Lemnos after Zeus threw him from Mount Olympus, and considering the island's volcanic nature, it is no wonder the legend of the Forge of Hephaestus carries on here until this day. Lemnos is unusual amongst Aegean islands, as the elevation remains quite low across the entire 478sqkm/184sqmi island, with mountainous terrain found only in the West & North-West rising to the highest point at the peak of Mount Skopia at just 470m/1542ft. The low elevation has given Lemnos an abundance of sandy beaches (over 30), yet leaves it's over 700 hectares(1730acres) of vineyards vulnerable to high winds that can damage the crop, though do assist in keeping the vines cool in the Mediterranean heat, allowing for more acidity and freshness in the wines of the island. Currently, following the lead of many other Aegean islands, the Muscat grape family has been the primary focus of the last century, with preference (now over 95% of all vineyard land on Lemnos) given to the Muscat of Alexandria grape variety which favours the volcanic soils and when found in exposed locations is often grown in a small cup shape, to shelter the vines from both heat and the worst of the winds. A majority of the vineyards are found in the small, shallow valleys that crisscross the Southern side of the island, which can offer some form of shelter from the howling winds. Appellations: Lemnos has been granted two appellations, both focused on Muscat of Alexandria, with PDO Muscat of Lemnos (est.1972) is dedicated to the sweet wines made from the grape while PDO Lemnos (est.1982) was set up to care for the exceptional dry to medium-sweet styles of the variety. While we have now covered off all the major wine producing regions in the Aegean Sea, it should be noted that almost all other Aegean Islands produce wine of some nature under the PGI designation (plus PGIs are also found on most of the islands we have discussed so far) and many are expected to have their own PDO designations in the decades to come. In my opinion the islands Lesvos, Kos and Chios could all be PDO candidates in the near future, with great upcoming wines and unique styles produced. Learning more about the historic wines of Greece continues soon!